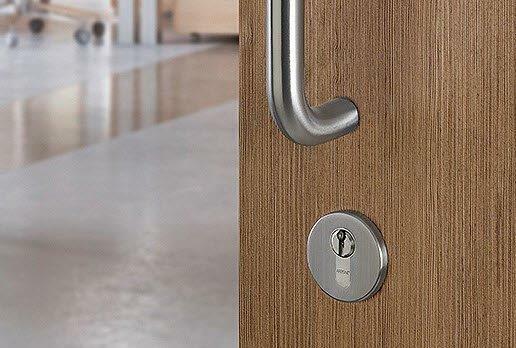 A new high end, fully patented cylinder lock range with a lifetime trade mark has been launched by HOPPE (UK) for a wide range of commercial, residential and industrial needs. The AR3000 range boasts a unique 14mm core which allows for more pin variations and an extremely high number of combination possibilities for larger, more complex master key systems at no extra cost. The system is patented until 2034 and has unlimited, lifetime trademark protection which prevents illegal duplication of keys. It also features tamper-proof technologies and classroom function. Cylinders can be made to any length – even to the longest lengths required in buildings with thicker doors for acoustic properties, such as music schools and theatres – and come in a wide assortment of double and single cylinder types and padlocks. Special finishes can be provided, including bronze and polished brass. “This is a stunning product, providing a level of security that is unrivalled in the cylinder market in terms of length of patent protection. We can match any finish required, and manufacture to any length. These cylinders can cope with the toughest demands, and perform to the highest standards. For further details on the ARRONE Specification Cylinder Range please call HOPPE UK on 01902 484400.